The all-American guests of the groom matched the desi bridal squad's dance moves step for step! Check out the cross-cultural bonding at Natasha and Derek's Gurugram wedding. It was a day they had been dreaming about for their entire lives, and nothing could compare to the moment they realized that this was it as the two locked eyes at their wedding ceremony. 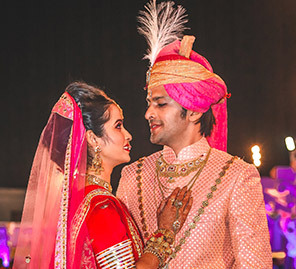 Natasha and Derek’s intimate Indian-style wedding at a private Chattarpur farmhouse was a perfect three days of celebration surrounded by friends and family. 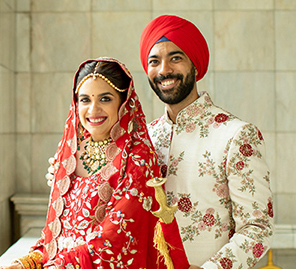 Family friend and Master Couturier Tarun Tahiliani hosted the beautiful nuptials and also fulfilled the bride’s dream of wearing his a creation by him on her big day. 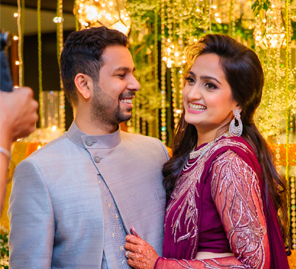 Here, we share highlights from the nuptials beautifully captured by WeddingSutra Favorite Nitin Arora Photography. The mehndi at the farmhouse was a party! Laidback, intimate and warm, it was attended only by the families’ dearest. From Natasha's father roaming around with bindis on his face to her mum singing traditional wedding folk songs, this celebration was about only two things: love and family. Natasha wore a red kurta with delicate embroidery which was both chic and chill. She says, “I am so grateful that everyone put so much effort into planning this function. It's exactly what I wanted and what I imagined". The mehndi was followed by a glamorous sangeet. The palette for the evening was primarily white and gold across the seating arrangements, dance floor and the warm lighting. The elegant aesthetics were enhanced further with touches of fresh foliage. Everything was classy and dreamy! Natasha looked resplendent in a blue lehenga and a sheer blue dupatta with silver accents. Unlike a lot of brides, Natasha did not burden herself with a lot of tradition. She wore what she loved, whether it was minimal jewellery or shades. The rest of the wedding party followed suit. 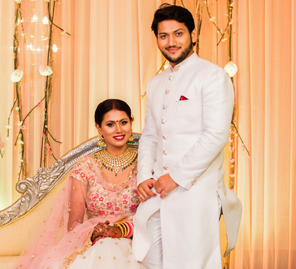 Her wedding lehenga was the perfect combination of an Indian wedding meets western minimalism. She then changed into a powder blue lehenga with self-colored chikan embroidery and a peach dupatta, and a kundan choker and earring set. The colors stood out beautifully against the decor palette. This gorgeous bride wore her look with sass and sophistication.